HAVE YOU EVER IMAGINED FLYING YOUR OWN AIRCRAFT? Perfect as your first airplane, the 172S Skyhawk combines aerodynamics, safety, and easy handling, providing complete peace of mind during your flights. The 172S Skyhawk is an airplane that is easy to operate, has a low operating cost, and allows landings on short runways. Its high wings guarantee more stability, besides offering panoramic views during the flight. 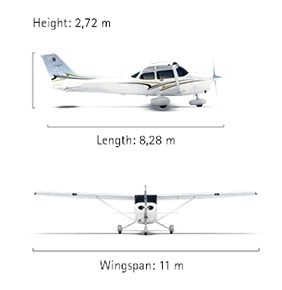 The model displays typical characteristics of a large aircraft, being considered one of the safest piston airplanes in the world and an excellent entry level product of the Cessna line. The model is equipped with a Lycoming engine, recognized worldwide for its durability and high degree of reliability. The cockpit is equipped with Garmin G1000 NXi avionics, which is the most modern in aircraft navigation panel equipment in this category. In addition to the high wings, which ensures more stability to the aircraft, the 172S Skyhawk contains two large doors, making it easy for passengers and cargo to enter and exit. The aircraft has ergonomic features that ensure more comfort for pilots and passengers, even in long flights.